That list of “can dos” includes muscle isolations, body rolls, hip lifts, ribcage circles and a host of other moves that make up belly dancing, a passion that started for Brickell in high school. An after-school club was her first exposure to this unique art form, a major change from her experience in colorguard where everything was regimented – so when you made a mistake, everyone knew it. In college, Brickell started her own belly dancing group, which is still in full force at Towson University, and then joined the Lazuli Dance Company based in Baltimore City, Maryland, after graduation. Her experience with this body-positive group of women continues to motivates her to fulfill her goal of becoming a professional dancer. For 36-year-old Laura Armstrong, who spends her days playing in an orchestra and teaching clarinet, weekly practices give her the chance to let loose and get creative. Rather than hiding behind a music stand, she said belly dancing allows her to become part of the music. 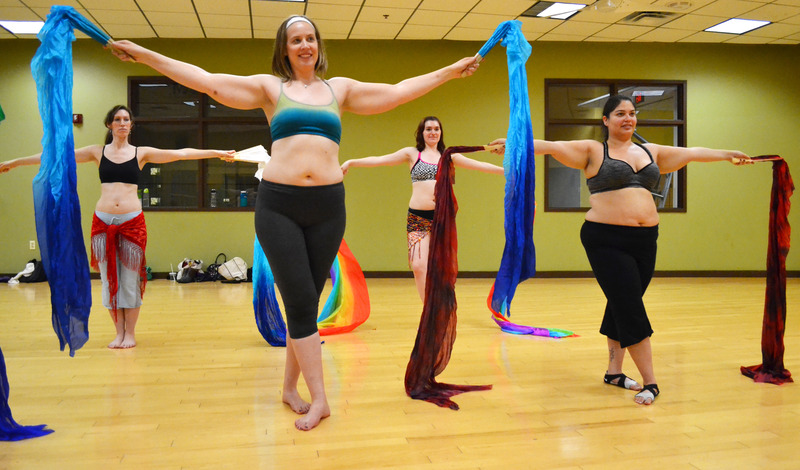 In fact, said dancer Emily Diehl, who has been belly dancing since she was 16, one of the origin stories of belly dancing is the celebration of femininity, being proud of and accepting all body types. Diehl performed for the first time in high school, having asked her coach a few days before if she had to show her stomach during the performance. Though the answer was no, Diehl decided she didn’t care what people thought about her weight and wore the original costume. Vicki Devlin joined the group after Brickell, having also been a part of the belly dancing club at Towson. She’s been dancing for eight years and the number one lesson she’s learned during that time is to love yourself and your body. Sarcasm, wine and everything fine. Female writer with some sass. adventure, alternatives, friendship, love, mental, physical, self, you're fabulous!